Hidden away between Lake Superior, Lake Independence, and the Huron Mountains of the Upper Peninsula, Big Bay, Michigan, is the place to get away from it all. Escape from the stresses of work to a place where the northern lights dance, fish jump in rivers, and it is easy to hear the wind rustling through the trees. Stay in our bed and breakfasts while exploring this wonderful town at the end of the road. Big Bay, Michigan is a remote township in the remote Upper Peninsula. Exploring the land and waters around Big Bay can be an adventure. Travel well stocked with provisions, and have fun searching for roaring waterfalls like Bush Creek Falls, marvelous fishing holes, and trails that lead deep into the woods. Discover rivers, streams and lakes great and small by canoe, kayak, sailboat, or on a cruise. 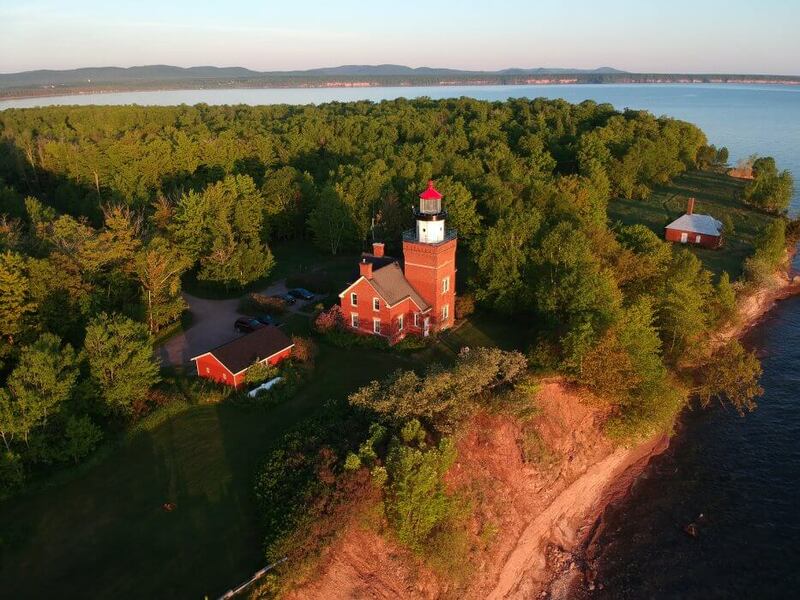 Look for the numerous Michigan lighthouses that line the Lake Superior coastline. It is often helpful to consult with bed and breakfast innkeepers before heading out for the day – their advice can be invaluable. When it snows in this part of the Upper Peninsula, it really snows; annual accumulation can reach twenty-five feet. Bring cross-country skis, snow shoes, or snowmobiles when staying at bed and breakfasts in the winter. Look into exhilarating dog sled rides through wooded trails. The Noquemanon Trails Network is a haven for skiers in the winter (and mountain bikers when the snow melts). Many people come to our bed and breakfasts with dreams of fish, and with good reason. Wild trout streams and rivers traverse the region. The Salmon Trout River is one of the last natural habitats of the Lake Superior coaster trout. Fly fishing is popular here, as is angling from any kind boat. When thick ice covers the lakes, ice fishing enthusiasts bundle up and grab their gear. It could be you.